Classic 1983 series Aura Battler Dunbine to stream on HIDIVE! Streaming website HIDIVE have announced plans to stream the classic 1983 sci-fi series Aura Battler Dunbine (Seisenshi Dunbine) for many territories courtesy of Sentai Filmworks. United States, Canada, United Kingdom, Ireland, New Zealand, Australia, South Africa, Netherlands, Turkey, Finland, Sweden, Norway, Denmark, Iceland, Greenland, Faroe Islands, Aruba, Curacao, Sint Maarten, Bonaire, Sint Eustatius and Saba, Argentina, Belize, Bolivia, Brazil, Chile, Colombia, Costa Rica, Cuba, Dominican Republic, Ecuador, El Salvador, Falkland Islands, French Guiana, Guadeloupe, Guyana, Guatemala, Haiti, Honduras, Mexico, Martinique, Nicaragua, Panama, Paraguay, Peru, Saint Barthelemy, South Georgia and the South Sandwich Islands, Suriname, Puerto Rico, Uruguay, Venezuela, Bonaire, Sint Eustatius and Saba. Aura Battler Dunbine will commence streaming starting Monday 23rd April 2018 with an episode added weekly. The legal stream will include both the original Japanese audio as well as the English dub while the video quality will be sourced from the recent high definition remaster. There are 49 episodes in total. You can view the main show page here. Ordinary 18-year-old Shou Zama is transported from his home in Tokyo to a new world known as Byston Well, which has been torn apart by an evil overlord, Drake Luft. Refusing to participate in Luft’s maniacal plans, Shou joins the resistance where he uses his incredible Aura Powers to fight for freedom using a lavender-colored mecha. Aura Battler Dunbine was directed by Yoshiyuki Tomino, known for creating the Mobile Suit Gundam franchise and also directing both Blue Gale Xabungle and Space Runaway Ideon. The story of Aura Battler Dunbine is based on the novel The Wings of Rean, also written by Yoshiyuki Tomino. 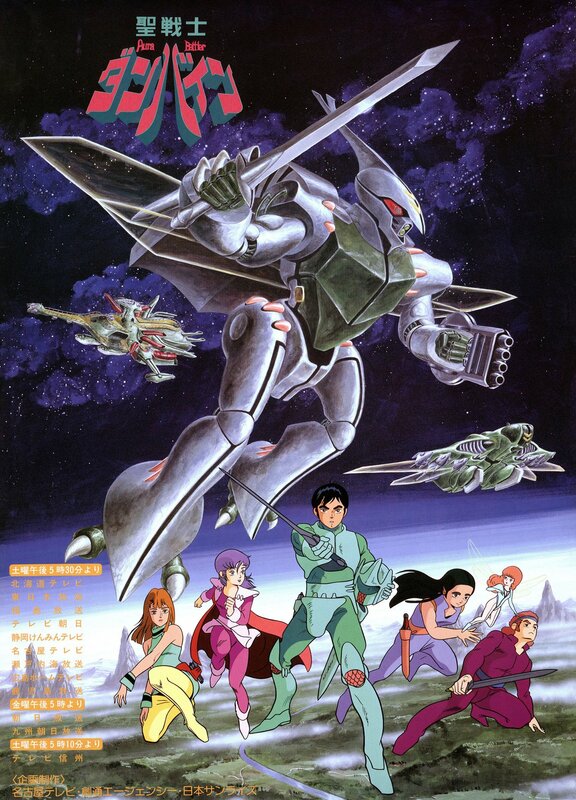 The anime was animated by studio Sunrise and aired between 5th February 1983 all the way til 21st January 1994. Aura Battler Dunbine also made appearances in the crossover video game franchises Another Century’s Episode and Super Robot Wars. Yoshiyuki Tomino’s other work, the Mobile Suit Gundam franchise, have been distributed in the UK & Ireland by Anime Limited on Blu-ray. Currently there’s no one holding the UK & Ireland home video rights for Aura Battler Dunbine as of the time of this article.